One year ago, the Cassini spacecraft, which logged over 13 years of observations at Saturn, plunged to its end in the crushing depth’s of the ringed planet’s atmosphere. Today, scientists are still studying the data the spacecraft send back to Earth. During the final days of operations, Cassini took a a series of images of the north polar regions of Titan. On Sept. 13, 2018, NASA released that mosaic of images, which were taken by the spacecraft on Sept. 11, 2017, just four days before missions end. The mosaic has a resolution of approximately 0.5 miles (800 meters) per pixel. Centered on 67.19 degrees north latitude and 212.67 degrees west longitude, the final image is an orthographic view, which NASA said is similar to how a distant observer with a telescope would see the area. The images were captured when Cassini was approximately 87,000 miles (140,000 kilometers) from Titan. The spacecraft used the Imaging Science Subsystem (ISS) narrow-angle camera, an instrument designed to capture photos in visible light as well as some ultraviolet and infrared spectrum. A special filter was used that is sensitive to near-infrared light at 938 nanometers, according to NASA. “Titan is a fascinating place that really teases us with some of its mysteries,” said Elizabeth Turtle of the Johns Hopkins Applied Physics Lab and the Cassini Imaging Science Subsystem team in a NASA news release. 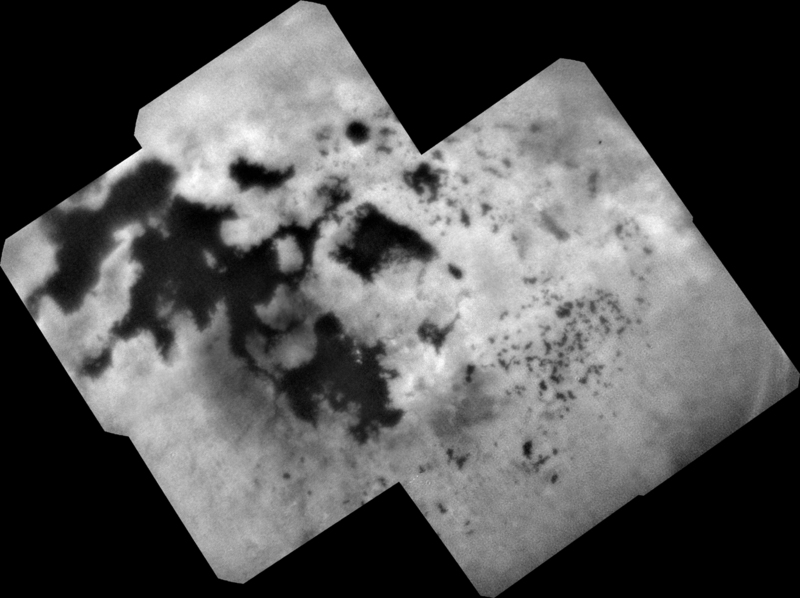 One of the mysteries that deepened with this mosaic has been Titan’s weather. It was taken during the summer in the northern hemisphere. Scientists expected it to look more like the cloud covered southern hemisphere during the summer there. Instead only a few clouds appear in the images. Titan has a dense atmosphere and a weather cycle similar to Earth. The difference at Titan is that instead of water, the cycle occurs with methane. Lakes and seas evaporate, clouds form, and rain falls just as it does here on Earth. Looking closely at the mosaic, it is possible to see Punga Mare which is 240 miles (390 kilometers) across just above the center of the image. Two other mare also appear—Kraken Mare which is over 730 miles (1,200 kilometers) wide is to the left and Ligeia Mare a 300 mile (500 kilometer) wide plain is just below center. Scattered about the mosaic are several lakes. According to NASA, while the weather cycle is understood scientists are still trying to understand how these lakes are formed.